Welcome to our family run Disney & Orlando site. We are the Levi’s and we plan to offer you a site where you can obtain useful tips and advice from planning a holiday, to helping you have the best possible experience while you are away. own family holiday, to the experiences we have whilst away. Please bear in mind that these are just our own opinions and experiences, but they will be 100% honest, from a real family that has experienced it first hand. My name is Tracey, I am a self confessed Disney addict (which I do not wish to receive any help for) it all started at a very young age for me, it was my Grandfather Fred who first introduced me to the wonderful world of Disney, together we used to watch “Cinderella” on a daily basis, from the age of two I was well and truly hooked! took me to Florida for my 15th birthday in February 1997 and we stayed at the Disney’s All Star Music Resort, all I can say is that it was the most fabulous 2 weeks of my life, although I was extremely disappointed to see the Castle as a giant pink cake!!!! I had been dreaming of that castle for the past 13 years, so as soon as we returned my Grandparents frantically started saving for the next trip. I returned again for my 18th birthday with them and this time my Mum Linda joined us too. 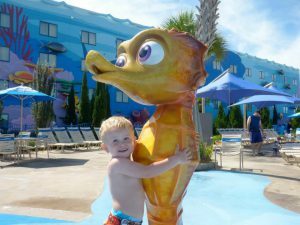 We stayed in the Disney’s All Star Movies Resort as we had such a fun stay last time. It didn’t disappoint again, my Mum thoroughly enjoyed her first Disney trip. As the years continued I was fortunate enough to have numerous trips with my daughter Summer at age 2, 3, 4 & 5. Each time we stayed off site at Comfort Inn (now the Clarion Inn) on Lake Buena Vista, during either May or early June time. Then, in 2009 I met my Prince Charming, Simon, and we married in 2013. Although not a huge fan to begin with Si agreed that we could book our Honeymoon to Orlando (like there was any other place I would consider) and we stayed at Disney’s Art of Animation Hotel in September 2013, amazingly upon arrival the hotel had upgraded our stay to a “Suite” in the Cars section. This was Si’s first ever Disney trip, and his first time in the US. We had the most wonderful 2 weeks, and he returned a complete Disney addict too, he really did have the Disney bug! Again, as soon as we returned he started planning a trip so we could return with our 2 year old son Charlie. So the following year we returned with Charlie and stayed again at the Art of Animation for 21 nights in a Little Mermaid room, it was fabulous. He had the time of his life. 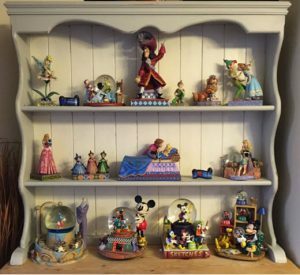 Disney slowly crept more and more into our home as Simon became a bigger and bigger fan, we have filled our home with our Disney photos and memories and have both become avid collectors of Disney Snow-globes and the Disney Traditions by Jim Shore. 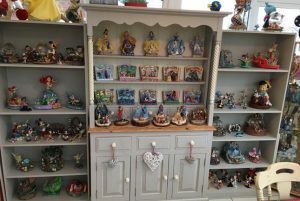 “Disney snow-globes, Traditions and all collectables selling and chat page” these are lovely for sharing our collections and seeing other peoples, and learning about other peoples holidays and experiences. Si also has a great deal of reviews on his TripAdvisor on various attractions, restaurants and hotels in Orlando. We couldn’t wait to return to Orlando and it was always at the back of our minds, but we put our plans on hold as we decided to increase our family and have another baby. Well, to our surprise we ended up having a little Mickey & Minnie of our own as we had Boy/Girl twins and we welcomed Ollie & Ellie into the world. 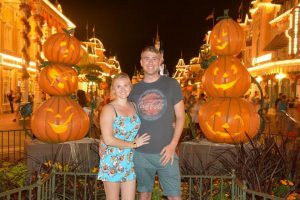 We decided to take a trip to Disneyland Paris in June 2015 when I was 23 weeks pregnant with the Twins, I did not want to fly so we took the Eurostar direct from St. Pancras in London which stopped almost at the doors of Disney, it was a fantastic service. 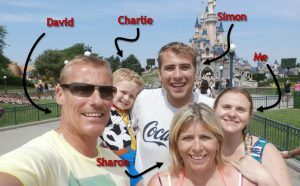 Due to me being pregnant and us already having Charlie we asked Simon’s parents Sharon and David to come along too, this was their first ever Disney experience. We all stayed in the Disney’s Newport Bay Hotel, they enjoyed themselves very much and we kept telling them that if they enjoyed the Paris experience then they would absolutely love Orlando. So, the obsession continued to grow, Sharon & David watched our family video footage from Florida and agreed that they really do need to go! So we were all in agreement that as soon as the twins were born we would start saving and planning for all of their 1st trips. 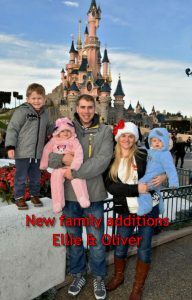 However we did manage to squeeze in a sneaky Disney Preview for the twins as we went back to Disneyland Paris in December 2016 when the twins were 15 months old. We stayed at the Disneyland Hotel and it truly was a very magical experience with all of the Christmas Decor, neither of us had ever seen Disney at Christmas time before, only Halloween. 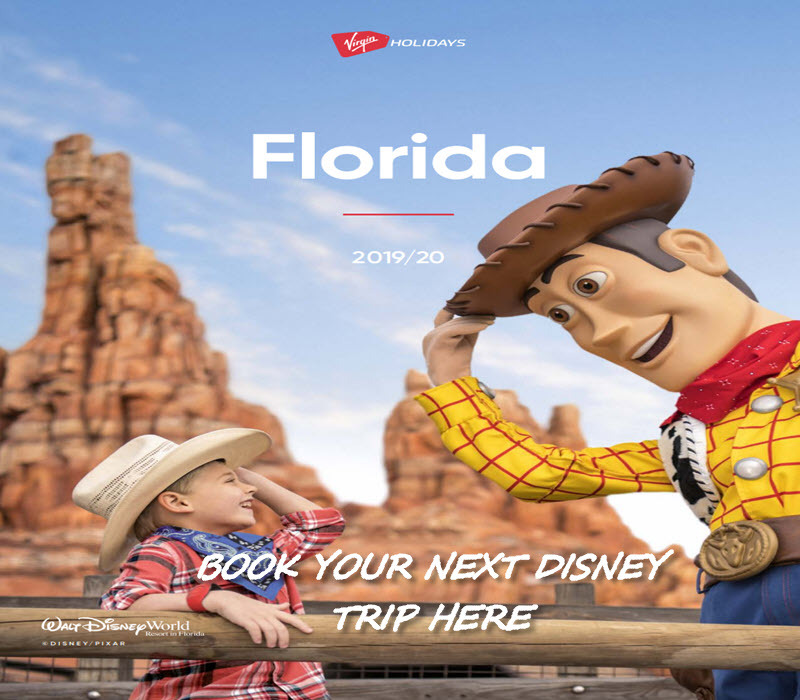 So it has been a long overdue visit to Florida for us, I am super excited about our next trip, lots of wonderful new things to experience, the magical feeling of your childrens’ first visit, and also being able to see and be part of Sharon & David’s first Orlando experience. The whole of the Levi gang is on board, so please join the 7 of us as we plan our best ever Disney holiday, the biggest group I have travelled with, and the most children. 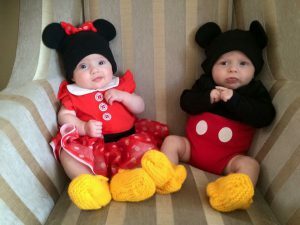 Find out how we get on planning a Disney trip with Twins and adults as first timers!!! All pages opens smoothly without any problems. Your menu button and all the details information given is very informative. From my view, its an awesome website you got here. No comment from me. All the best to you in the future. Thank you. Hopefully you Visit us again. Have you ever been to Disney?